When I accepted my latest job, I'll admit I was a little reluctant. I knew I'd be away for the entire Summer, and in the humid heat of Tennessee. But it wasn't only the thought of frizzy hair that made me second guess myself, it was the thought of leaving town for the 4th of July. It's not really the holiday that I'd be missing, but mostly the thought of leaving my kitchen during one of the biggest food celebrations of the year. Most of the time when I travel for work I stay in hotel rooms with little kitchenettes, nothing really equipped for the sort of baking I like to do in my spare time. But I lucked out on this gig, and I'm fortunate enough to be staying in a fully furnished apartment, with a tricked out kitchen. The biggest challenge of baking while away from home was not having my stand mixer, because I've been very spoiled and have always had one at my disposal. While I was searching through the baking section of Publix I found a little hand crank mixer, and was pleasantly surprised to find that it works very well. It's small enough to fit into my luggage so I'll be bringing this with me every time I travel from now on. I also had to improvise and use a glass to roll out the dough, like a damn pioneer. I feel very accomplished after baking without all my fancy tools! So, knowing that the 4th was coming up, I planned to make a dessert that not only reminded me of home, but that I could share with my coworkers. Cue the dessert pizza. It's not a pizza at all, it's just shaped like one. A giant sugar cookie topped with cream cheese frosting and fresh fruit. When I was little we used to make this all the time in the summer, and we'd always buy a star fruit to put right in the center. And then, like clockwork, we'd bite into the star fruit and wonder how we managed to forget how sour and awful it was. 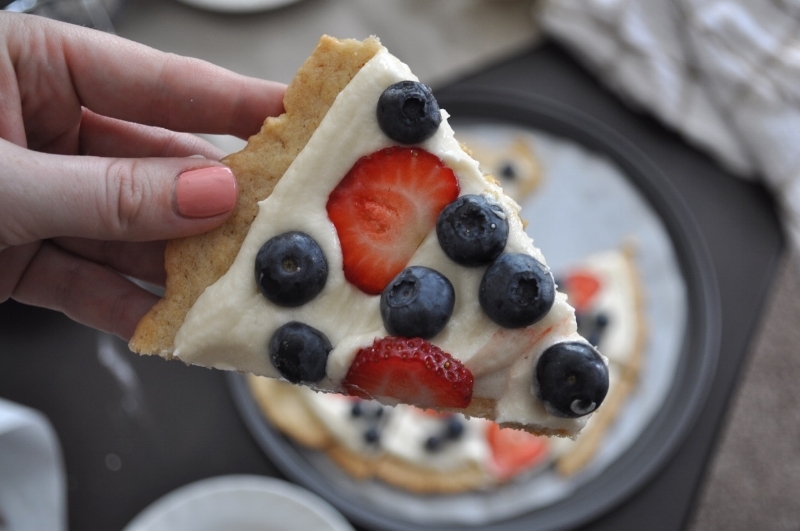 Here's why fruit pizza's are great: easy, quick and full of fruit. You can top with all kinds of delicious fruits, and organized them in really pretty ways. In fact a quick search of #fruitpizza on instagram is full of inspiration if you're in need of some. I'm not totally sure of the history of fruit pizza's, but I hear they were all the rage in the 90's, and for good reason. Side note: the natural light in my apartment is glorious here! I love how all these photos turned out! In a large bowl, cream the vegan butter and sugar together. Add in the baking soda, salt and flour until a thick paste forms, and thin it out a little by adding the vanilla and plant based milk. You should now have a thick sugar cookie dough ball that you can roll out onto a pie plate lined with parchment paper. Should be about 1/4" thick. Bake in oven set at 350 degrees Fahrenheit for about 10-12 minutes, watching carefully so as not to over bake. Let cool. While the giant cookie is cooling, prepare the cream cheese frosting by creaming together the vegan butter, shortening and cream cheese. Then slowly add in the vanilla and powdered sugar to form the frosting. Scoop onto the giant cookie and top with your choice of fresh berries. Best served immediately, but you can wait up to 2 hours before serving if needed. This recipe won't last much longer though, so if you're bringing it to a gathering it's best to bring the frosting separately and decorate there.